We will be OPEN our regular hours of 6am-11pm on Veteran’s Day, Wednesday, November 11th. We hope to see you for delicious coffee on this day of honoring Veterans. Come by and meet up with friends for lunch or gaming, make progress on your NaNoWriMo word count, catch up on studying, or just relax with a good book and one of our tasty geek-inspired coffee drinks! Wishing you all, and especially our Veterans, a wonderful day. That’s right, its Wayward Coffeehouse’s TENTH ANNIVERSARY! The wonderful Wayward community began when we opened our doors to customers 10 years ago and we’re celebrating with a very shiny SHINDIG coinciding with our annual SERENIVERSARY event (that would be our annual celebration of the release of our favorite scifi film, Serenity). We would not be here without all of YOU, or wonderful Wayward community of friends and supports. Please come celebrate with uw! There will be live music with Vixy & Tony, a Whedonverse & Wayward trivia quiz, raffle with prizes, and a reading from a Firefly fanfiction written by the owner of Wayward! Firefly/geekdom costumes encouraged! We hope to see you there! 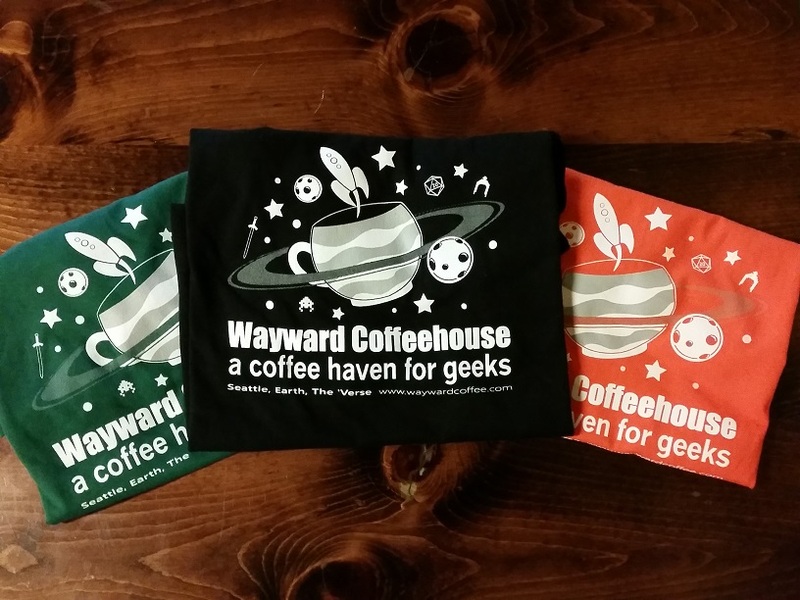 Our new TSHIRTS showing our new “Wayward Coffeehouse / A Coffee Haven for Geeks” logo have finally arrived! We are so gorram excited! They are available in BLACK or GREEN in Unisex/Mens (S,M,L,XL,2XL,3XL) and Womens (M,L,XL). We also have Kids/Youth sizes in Orange (4/5,7/8). We will also have TOTE BAGS arriving next week! Adult shirts are $20 ($23 for 2X and 3X) and Kids/Youth are $15. Tote bags will be $10. We love dads and want to say THANK YOU to all the great dads out there! So we’re giving away FREE COFFEE for DADS on Father’s Day! Come to Wayward Coffee House with your dad (or with your child/children) on Father’s Day and get a FREE beverage when you purchase a second beverage of equal or greater value. Limit one free beverage per dad. Valid only on 6/21/2015 and you must be with your dad or your child/children to redeem. Come out to Wayward on Sat, 6/20, for a night of lively Scottish, Irish, and maritime music from The Whateverly Brothers and Tom Rawson. We’re very excited to welcome The Whateverly Brothers back to Wayward after a long absence and to welcome Tom for his performance at our wonderful coffeehouse. Hope to see you on Saturday! We love moms! So we’re giving away FREE COFFEE FOR MOMS on Mother’s Day! Come to Wayward Coffee House with your mom (or with your child/children) on Mother’s Day and get a FREE beverage when you purchase a second beverage of equal or greater value. Limit one free beverage per visit. Valid only on 5/10/2015 and you must be with your mom or your child/children to redeem.